HMS Trent, the third of the Royal Navy’s five new Offshore Patrol Vessels, has been formally named at the Glasgow shipyard where she was built. HMS Trent has been formally named in Glasgow. Crown copyright. 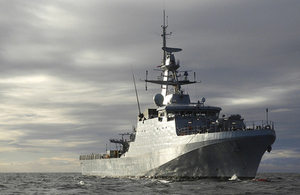 Within the next few days the 90-metre warship, which is the third to be named following HMS Forth and HMS Medway, will take to the water for the first time and make the short journey across the Clyde from Govan to Scotstoun where she will be fitted out for sea trials. The ship’s sponsor, Mrs Pamela Potts, officially named the ship by pressing a button to smash a bottle of gin, which was distilled close to the River Trent, against the hull. Trent’s lady sponsor Mrs Potts is the wife of Vice Admiral Duncan Potts, Director General of the Defence Academy of the United Kingdom. HMS Trent will, alongside her sister ships Forth, Medway, Tamar and Spey, make a significant contribution to the defence of the UK by performing vital counter-terrorism, anti-smuggling and other maritime security operations to secure the UK’s borders. As the third of five Offshore Patrol Vessels being built in Scotland, HMS Trent will soon be part of a fleet of highly capable ships. These new vessels will keep the UK safe by conducting counter-terrorism, anti-piracy, anti-smuggling and other vital maritime operations. UK Defence has invested in an unprecedented ship-building production line in Glasgow and the city’s shipyards with their 1,700 highly skilled engineers and technicians, benefiting from full order books for the next two decades. The sixth Royal Navy vessel to bear the name, HMS Trent will be armed with a medium-calibre gun and a flight deck capable of accommodating a Merlin helicopter. This is another welcome milestone in the delivery of the Royal Navy’s new Offshore Patrol Vessel fleet – one which we are celebrating alongside our partners in the Royal Navy and industry. We look forward to the delivery of the remaining OPVs and good progress in the Type 26 build programme. The work to build the new OPV fleet is sustaining jobs and the shipbuilding skills vital to the construction of the new Type 26 Frigate fleet. The first Type 26, HMS Glasgow, is currently under construction in Govan. Following a period of rigorous sea trials, HMS Trent is expected to be delivered to the Royal Navy in the second half of 2018.